MHA developed the Before Stage 4 (B4Stage4) philosophy which follows the principle of “mental health conditions should be treated long before they reach the most critical points in the disease process. “The plan of action for combating heart disease and cancer has a solid blueprint — prevention, symptom identification, treatment with hopes of reversing (or stopping the progression) of the disease. B4Stage4 educates and brings attention to early symptoms and identifies of the underlying disease of mental illness. This knowledge is crucial in developing a successful treatment plan. Mental illness is not rare in the United States. The National Alliance of Mental Health (NAMH) cites mental health conditions as “the leading cause of disability across the United States.” Based on data published by the Substance Abuse and Mental Health Service Administration (SAMHSA), in 2015, there were nearly 44 million Americans with AMI (Any Mental Illness). AMI is defined as “A mental, behavioral, or emotional disorder (excluding developmental and substance use disorders); diagnosable currently or within the past year; and, of sufficient duration to meet diagnostic criteria specified within the 4th edition of the Diagnostic and Statistical Manual of Mental Disorders (DSM-IV).” AMI covers a broad range from “no impact to mild-impairment to significantly disabling impairment” which is known as SMI (Serious Mental Illness). Mental illness is treatable. Yet, according to the NAMH, less than half the adult Americans who need treatment get it. Mental illness is very real, and unfortunately so is the stigma that shrouds it. In some instance, those with mental health conditions face bullying, rejection, and discrimination. Encountering these things makes the road to recovery even more winding. Stigma leads to isolation and secrecy which severely hamper treatment. Here is a sobering fact, NAMH states, “Suicide is the second leading cause of death of youth ages 15-24 and the tenth leading cause of death for all Americans.” There is nothing embarrassing or shameful about mental illness. NAHM suggests three steps to becoming stigma free — 1. Educate yourself and others, 2. See the person, not the condition, and 3. Take action. Our area has a valuable network of programs and services consisting of professionals and volunteers with the mission of helping those with mental illness as well as erasing the stigma that comes with the disease. Mental health should be viewed with the same importance as physical health. Like all physical health conditions, prevention, necessary and early treatment with the goal of recovery is the focus of mental health. “I don’t think we give much thought to our overall mental health or understand how it impacts our overall physical health. We also know, like other physical health problems, the earlier we can detect a mental health condition the better we can treat the problem and prevent it from escalating,” Oakes says. Early detection is the key and understanding mental first aid could help you help someone else if the need presents itself. “Most of us know how to apply a bandage to a cut or know the signs of a heart attack. Many know how to start CPR or call 911. Very few of us know the signs of a panic attack or know what to do if we are concerned about someone we love who may be struggling with mental illness or drug abuse. MHFA takes the fear and hesitation away and it gives you a plan of action to use,” Oakes adds. For more information, visit Mental Health First Aid. Melanie Tosh, a Licensed Professional Counselor and Director of Adult Clinical Services at DPCS, says, “CIT stands for Crisis Intervention TEAM. Some people mistake the name for a training program. CIT is more than just training. It is a mindset and a team approach to assisting people experiencing a crisis that happen to have a mental illness or addiction to substances. “As Director of Adult Clinical Services, Tosh supervises the Emergency Services Coordinator, Adult Outpatient Services Coordinator, CIT Coordinator, and the Residential Manager for Piney Ridge Apartments. “We manage crisis situations on a daily basis. Individuals are able to be seen on a walk-in basis for numerous reasons. Some individuals are seeking services to address mental health and substance use issues. Some individuals are in a mental health or substance use crisis and need help on a more immediate level. Our clinicians assess these individuals and recommend an appropriate service level for the individual from a referral to community providers to the need for hospitalization,” Tosh says. “CIT brings awareness to criminal justice and mental health professionals in our community who often come in contact with individuals experiencing a crisis and diagnosed with a mental illness or co-occurring substance use disorder. These professionals include law enforcement, jail/corrections officers, and mental health clinicians.,” Tosh says. CIT utilizes training and community relationships to bring attention to the symptoms of mental illness and to offer ways to approach someone who is dealing with a mental health or substance abuse crisis. “CIT provides an opportunity to understand what it may be like to ‘be in the shoes’ of someone diagnosed with a mental illness. Training also brings awareness to the resources available in the community that can help. This mindset helps to reduce the stigma of mental illness and to help professionals take the time to listen to individuals in hopes of directing them to appropriate resources. . Individuals may come to the attention of law enforcement, corrections, or other first responders due to exhibiting symptoms or behaviors that are misinterpreted as criminal in nature, inappropriate, or dangerous. CIT has enhanced officer skills to more effectively communicate with and understand the needs of individuals with mental illness in our community. 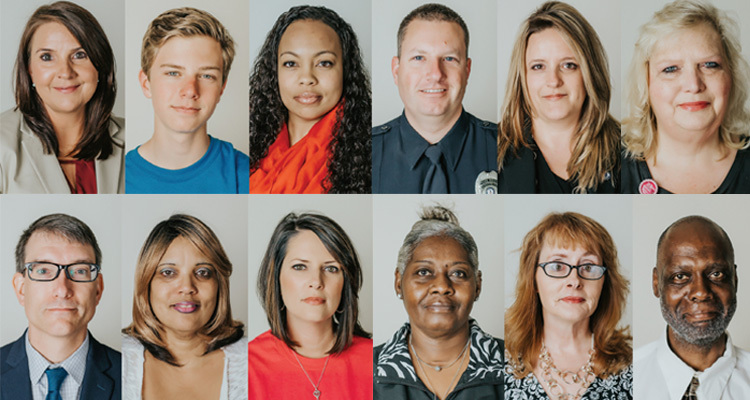 In numerous situations, officers are able to reduce the potential for misunderstanding and improve their ability to de-escalate situations while reducing the need for arrest and/or incarceration, afford individuals with mental illness a sense of dignity in a crisis situation, link individuals to appropriate care, reduce the risk of injury, and increase the public’s awareness of mental health needs in our community. ” Tosh adds. Individuals experiencing a mental health or substance abuse crisis can request a CIT-training officer to respond to the scene. Locally, the CIT course is a 40-hour, 5-day curriculum that is approved by the Virginia Department of Criminal Justice Services (DCJS). Tosh says, “CIT’s training curriculum is designed for law enforcement, jail/corrections officers, and other first responders. Our local law enforcement and jail/corrections officers are strongly a part of our CIT program. Thus far, Danville-Pittsylvania CIT has trained 285 officers and clinicians, as well as 35 dispatchers. We would like to expand our team to include other first responders such as fire and EMS by participating in training.” If you don’t belong to those groups but would still like to learn more about mental health and the skills needed when addressing a mental health crisis, Tosh suggests attending a Mental Health First Aid or Applied Suicide Intervention Skills Training (ASIST) workshop. “It has been a pleasure to be a part of the Danville-Pittsylvania Crisis Intervention Team. The team has built a bridge between our law enforcement and corrections officers and the mental health system. Through this process, our community professionals are able to work together to better help the individuals we serve. We reach out to one another to solve complex issues, understand each other’s role in the mental health system, and work together to reduce the stigma of mental illness while connecting individuals with services,” Tosh concludes. DPCS Emergency Services provide 24-hour crisis intervention, counseling and referral, brief counseling, pre-admission screening for hospitalization, and court liaison services for involuntary commitment procedures. Any individual can access DPCS emergency services on a walk-in basis for assessment and referral services Monday – Friday at 245 Hairston Street from 8:30am – 3:30pm. DPCS Emergency Services are available 24/7 at (434)793-4922 or Toll Free: 1-877-793-4922. In Virginia (and nationally) suicide rates are on a gradual incline. Based on figures from the Virginia Department of Health, in 2013, 1,047 Virginians committed suicide. That number increased to 1,146 in 2014. Suicide ranked as 11th for the cause of deaths among Virginians in 2013. It was the 2nd leading cause of death for the ages of 10 to 24 in 2013. The mission of SEAS is to promote suicide prevention awareness and education in our community through the understanding that prevention and knowledge are the essential keys to saving lives to those at risk of death by suicide. “Once these signs have been identified, it is important to ask the person if he/she is having thoughts of suicide, has a suicide plan, and feels that he/she has no resources. If the answer is YES to any of those questions it is then vital to develop a temporary safety plan which includes removing possible means, linking the person to his/her support system, and connecting him/her to a mental health professional,” McCoy says. For those interested in joining SEAS, the coalition hosts many community event trainings, conferences, and panels. For more information, email SEAS. For immediate help, contact the National Suicide Prevention Lifeline at 1.800.273.8255 (TALK) or dial 911. There are many risk factors for suicide. Some may not be easy to detect which makes education that more valuable. “Most people who take their lives do exhibit warning signs. There is a change in the way they talk, their behaviors and/or their mood. There are several risk factors that come into play including a mental health condition, stress, and a family history. Most occur when there is a convergence of risk factors that create a sense of being overwhelmed or in extreme pain,” Eanes-Brooks says. There are steps to take for families, friends, and colleagues who suspect they know someone at risk of suicide. “ If someone fears that a loved one is contemplating suicide — ask the question in private. ‘Are you considering suicide?’ Listen to his/her answers. Let him/her know his/her life is important to you. There are trainings available that are available in this area. ‘Talk Saves Lives’, SafeTALK and ASIST. The Lifeline is an excellent resource as well. The number is 1.800.273.8255 or you can text 741-741. This line can assist you with talking to a loved one as well as if you are struggling and need help,” Eanes-Brooks says. For more information about AFSP, visit AFSP. If you would like to join the Out of the Darkness Walk to help raise awareness and funds, visit Danville Walk or got to AFSP and search for the walk closest to you.